Brain organoids look like something between a malformed human brain and a character from Monsters, Inc. But don’t be fooled by their grotesque appearance. Ever since their introduction three years ago, brain organoids—charmingly dubbed “mini-brains” and “brain balls”—have been a darling in neuroscience research. Made from cells directly taken from human donors, these tiny clumps of cells roughly mimic how a human brain develops. Under a combination of growth chemicals and nurturing care, they expand to a few centimeters in diameter as their neurons extend their branches and hook up basic neural circuits. Brain balls are as close as scientists can get to recreating brain development in a dish, where the process can be studied and tinkered with. To most neuroscientists, they could be the key to finally cracking what goes awry in autism, schizophrenia, and a myriad of other brain developmental disorders. But when Dr. Howard Fine, an oncologist at Weill Cornell Medicine, first heard about these bizarre quasi-brains, development was the last thing on his mind. What if, he thought, I’m looking at the solution to brain cancer? An oncologist studying glioblastoma, an especially aggressive type of brain cancer, Fine has treated over 20,000 patients in his 30 years at work. “Almost all of them are dead,” he said recently to STAT news. A diagnosis of glioblastoma—like AIDS in the 1980s—is essentially a delayed death sentence. Survival rate is a measly two percent three years after diagnosis. There are no effective drugs on the market. Every person’s brain cancer is its own amalgam of tumor cells. Like a mortal game of whack-a-mole, destroy one type, and the others can still spread and roam free. Physicians have long thrown everything they’ve got at the aggressive cancer. Surgery, chemotherapy, radiation. Glioblastomas have little tentacles that cling onto normal brain tissue, and even surgically removing all the visible bits doesn’t work. In one extreme case, a surgeon excised the entire half brain that harbored the tumor—and the patient still died because the malignant cells had already invaded the other half of the brain. The problem, according to Fine, is that oncologists have been pigeonholed. Like most medical fields, scientists heavily rely on mouse models when studying glioblastoma. How it usually works: a physician takes a sample of a patient’s brain tumor, expands the cells in a dish and transplants those resulting cells into a mouse. There, the hope is that the tumor cells will spring back into action, taking over the rodent’s brain as they had in the patient. Unfortunately, this standard approach doesn’t really work. One of the reasons glioblastomas are so insidious is that they contain tumor stem cells, which are notoriously hard to target with standard chemo—like a spark, they readily ignite the entire cancerous flame if even one escapes therapy. As it happens, tumor stem cells are also tough to grow in the lab. So when scientists carefully prepare the cells to transplant into mice, they inadvertently miss one of the most crucial populations. The result is that glioblastomas are mysteriously tame after transplantation: they’re not nearly as aggressive as their original source. In other words, scientists don’t really have a good way to study glioblastomas. Lacking a suitable model makes testing potential new drugs or other therapies extremely difficult. It’s no wonder that prospective treatments in mice hardly ever translate to successful clinical trials. It’s oncology’s “dirty little open secret,” says Fine. “My stance as an old man in this field is, someone has to start doing something different,” he says. 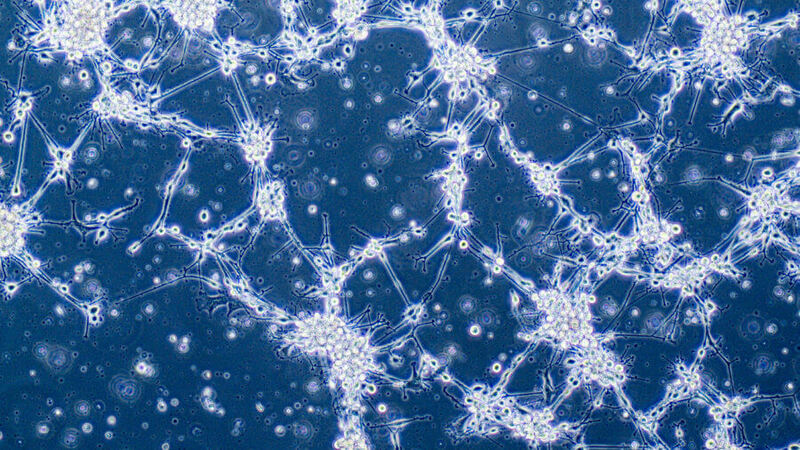 When Fine came upon the first report of brain organoids in 2013, he immediately perked up. Could these quasi-human brains replace mice brains? he wondered. After a few unsuccessful bouts with the brain organoid recipe—the first few batches took a wrong route towards quasi-pancreases and colons—he figured out the ingredients to make it work. In roughly six weeks, his team grew mini-brains roughly the same level of development as a 20-week-old human fetus. Immediately, the brain organoids proved their worth. When placed together with glioblastoma stem cells from patients in a dish, the cancer cells readily clamp onto the mini-brains. Within 24 hours, they begin driving their tentacles deeper into the brain-like tissue in a pattern “that looks 100 percent like what happens in the patient’s own brain,” says Fine. What’s more, the brain-like environment of mini-brains revealed some strange properties of the cancer normally not detected in mice models. Individual tumor cells seem to extend lengthy tubes that connect each other, much like an elaborate subway system. This network could be why these tumors are so good at resisting chemotherapy and radiation, says Fine. It’s a strong lead: drugs that dismantle these networks already exist and could be tested in future studies against glioblastomas. Although Fine began making mini-brains using healthy cells, in the past few months he has turned his attention towards organoids grown from cancer patients. Glioblastomas are known for their individualized “signatures”: each one harbors a slightly different soup of cells depending on the mutated DNA and signals from the environment. Recapitulating the right combination of cells in the right percentages is exceedingly difficult—but because mini-brains mimic the patient’s own brain development, they offer a one-stop solution. The plan is to “make hundreds of brain organoids for any given patient and use them to screen for drugs that can shrink that patient’s tumor,” he says. According to STAT, earlier this year, Fine received approval to test out the strategy in one patient with advanced glioblastoma. His team created brain balls from her cells, added her tumor cells to give them cancer, then threw drug after drug onto the brain surrogates. Unfortunately, the patient died before the team found a hit. But Fine still believes in his approach. Glioblastoma patients are often too sick to withstand a drug screen. Even if, by some slight chance, a drug did magically work for a specific patient’s tumor, often there isn’t enough time for doctors to find that “unicorn” drug. With hundreds of brain organoids simultaneously taking the brunt, that search may end a lot faster with a much happier outcome. Last month, Fine received the prestigious National Institute of Health (NIH) Director’s Pioneer Award for his foray into cancerous mini-brains. With support in hand, Fine plans to further enhance the realism of their organoids by adding two bonus components: blood vessels, which support the health and growth of both normal brain cells and tumor cells, and immune cells that are an integral part of the brain’s natural defense system. It’s high-risk, high-reward research; a “bold departure” from traditional ways; a paradigm shift in a long-stymied field.